Nederland, Colorado is located 17 miles due west of Boulder, Colorado up scenic Boulder Canyon.. Nederland is a small town of about 1500 people, consisting of a mix of students, hippies, working people from Boulder, and retirees. 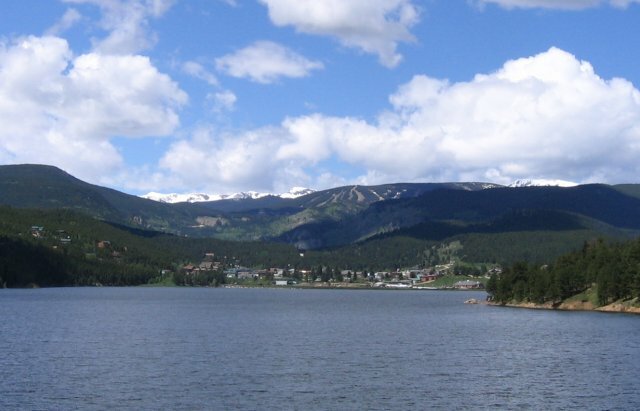 Located next to Barker Reservoir with the Indian Peaks Wilderness as its backdrop, Nederland boasts of stunning scenery. Despite its location, Nederland is not your typical tourist town. With a quirky vibe, Nederland marches to its own drummer. Tourists visiting Nederland won’t find a McDonalds or a Starbucks. Instead, unique businesses like the Blue Owl Books and the Nederland Co-op provide gifts and food for tourists visiting the area. Established in 1877, Nederland has a rich mining history, and is closely associated with the Caribou silver mines. Nederland grew quickly after a silver mill was built to process the silver ore from Caribou. The Caribou mines were purchased by Dutch investors, thus giving the town its name, which is Dutch for the Netherlands. Nederland actively mined gold, silver and tungsten until the 1950s. To learn more about Nederland’s history, visit the Mining Museum located directly on the roundabout, at the intersection of Highways 72 and 119. A decade later, the Eldora Ski Resort was built, helping Nederland turn to tourism and recreation to support its local economy. In the 1970s, the Indian Peaks Wilderness was designated, generating many visitors to this mountain town during the summer and fall months. Today, the Indian Peaks Wilderness is one of the most visited Wilderness areas in the country. Nederland’s population has changed little during the last three decades, due to the amount of public lands surrounding it. In addition to shops and restaurants, Nederland also has one motel and a variety of alternative lodging to serve those who visit. One of its greatest attractions that delights those of all ages is The Carousel of Happiness located in the shopping center off Highway 119. The Carousel includes hand-carved animals of every size that anyone can ride for one dollar. One of the best times to visit is during the fall color season. A drive on the Peak to Peak highway provides breathtaking views of the many aspen groves turning gold, orange and even red. For more information, please stop by the Nederland Visitor Center.